Early in his legal career, John VanDuzer was appointed a judge, a bestowing of authority that he accepted humbly and used wisely throughout his 36 years on the bench. Together with Judge David Steinberg, John VanDuzer is credited with the creation of Hamilton’s Unified Family Court in 1977, a pilot project that brought together in one courthouse all cases involving marriage breakdown, child custody and access, domestic violence and youthful offenders. The model has since been adopted throughout Canada. John was a strong advocate of mediation and alternative dispute resolution and believed it was better for families to work out their problems without resorting to a trial. 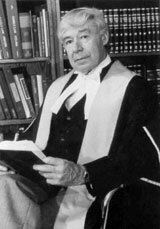 A true collaborator, he was inspired by the interdisciplinary knowledge and perspective of groups such as the US-based Association of Family and Conciliation Courts, of which he became the first Canadian president. In 1992 John was 65 and became “supernumerary,” which meant a reduced work load. At a gala retirement dinner, it was announced that a fund was established in his name at Hamilton Community Foundation to support students in family law.